Released on the 9th November 2018, 80's Symphonic collected some of decade's most iconic songs and rearranged them for a 50-piece orchestra. Alongside tracks by David Bowie, a-Ha and Ultravox was a new orchestrated version of Alive And Kicking. Most of the tracks were produced by Andy Wright working with Gavin Goldberg, the team who produced Big Music, Acoustic and Walk Between Worlds. The arrangements were by Sam Swallow who'd also arranged the orchestral backings on Walk Between Worlds. And, in another Simple Minds connection, the sleeve was designed by Stuart Crouch of Peacock and Stuart Crouch Creative. He'd been working on Simple Minds' artwork since Celebrate: The Greatest Hits. Alive And Kicking was released on the 1st November 2018, nine days before the album. It was given its own artwork, which was based on the cover of the album. A tiny number of single-track CD promos were also distributed. 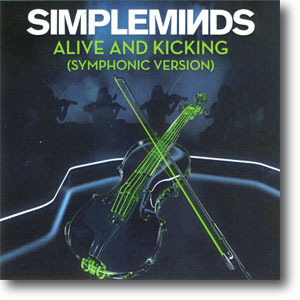 These featured the same, full-length version of Alive And Kicking.